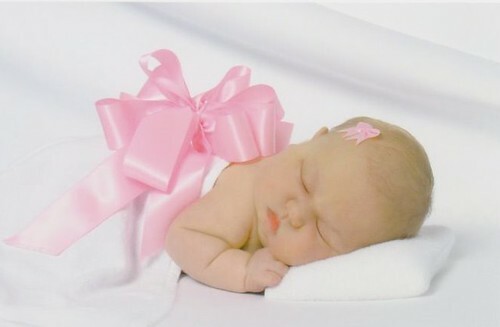 On November 30, 2009, Cora Mae McCormick was born and has become a hero thanks to the devotion of her loving parents. Cora passed away on December 6, 2009 in her mother’s arms from undetected congenital heart disease (CHD) while nursing. Cora never could have known how much her precious life has changed the world, but no doubt she is looking down at her Mommy Kristine smiling proudly. Back in February, Kristine was my first and only guest blogger to date. She wrote a beautiful poem called My angel forever for Congenital Heart Disease awareness week. Today is Cora’s 6 month birthday. On this day, we celebrate and remember Cora by wearing pink along with Kristine and her family. This beautiful little girl is helping to spread the word about CHD and save other lives in the process. Although I do not own pink summer clothing, I will be thinking about Cora as I knit a special pink item for Kristine. You can read the letter to Cora on her 6 month birthday here. When I send Kristine some special pink items, I will also be giving her a check. 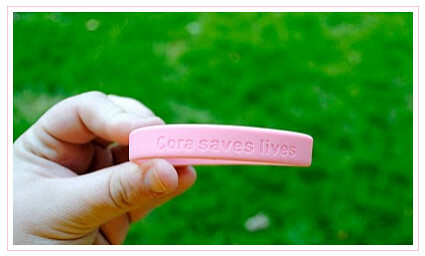 I want to support her non-profit organization and have my own Cora Bracelet. Here is where you can go to get your own Cora bracelets like the one seen below. Please stop by to visit Cora’s Story to support Kristine and Cora in their quest to get the word out about CHD. Big hugs going out to Kristine for being such a wonderful mother. Thank you so much. Every mother needs to hear they’re a wonderful mother. Especially me. .-= Kristine´s last blog ..Dear Cora: Memorial. =-. Thank you for posting this, what a wonderful tribute to a beautiful baby. It’s good to see something so important emerge from such a sad situation.